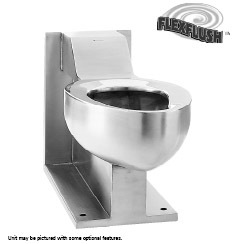 These Toilet Fixtures are designed for high security areas with an accessible pipe chase. The fixtures are fabricated using 14-gauge type 304 stainless steel, seamlessly welded to form a one piece, vandal resistant unit. Internal piping is stainless steel. Exposed surfaces are polished to a satin finish, except for the integral seat which is polished to a bright mirror finish. Metcraft bowls and assemblies are designed to withstand 5000 lb. (22kN) loading without permanent deflection and damage. They meet or exceed ASME 112.19.6M for hydraulic performance and ASME 112.19.2M for physical dimensions. The trap will pass a 2 5/8" (67mm) dia. ball. A minimum 1" (25mm) supply of 25psi (172kPa) flushing pressure is required. An accessible pipe chase is required. Toilet must first be set in place and sealed to closet flange. Four 1/2" (13mm) dia. plated steel anchor rods screw into sockets on back of the fixture. Anchor rods are secured with washer lugs and hex nuts on the chase side of the wall. Floor anchors consist of two 3/8" (10mm) threaded steel studs and vandel-resistant cap nuts to secure unit to floor. Gasket flange is also supplied with two 3/8" (10mm) dia. mounting holes 6" (152mm) on center for mounting to waste flange. The installer must provide wall openings for anchor rods and piping per roughin drawings provided by Metcraft. Fixture meets A.D.A. requirements when installed per A.D.A. guidelines. • Floor mounted, floor outlet waste. • 4150 back supply connection 11/2" (38mm) FIPT. • 4155 top supply connection 11/2" (38mm) MIPT. • 3" (76mm) OD toilet waste tube with 51/2" (140mm) dia.